I kill succulents. I kill them so often and so quickly that the garden center should probably have my picture on their wall with a notice saying “Do Not Sell Succulents To This Woman”. But so far I’ve been able to elude them or they’ve just decided that they make a lot of money from me and my succulent exploits. With that in mind, please know that this is not a tutorial on keeping succulents alive! I wanted to rehab this terrarium from a couple of years ago that has been dormant for…18 months. That means I was able to keep the succulents that were originally in it alive for 6 whole months. This also means that I’ve had a big bowl of dirt sitting in my bathroom for a year and a half. 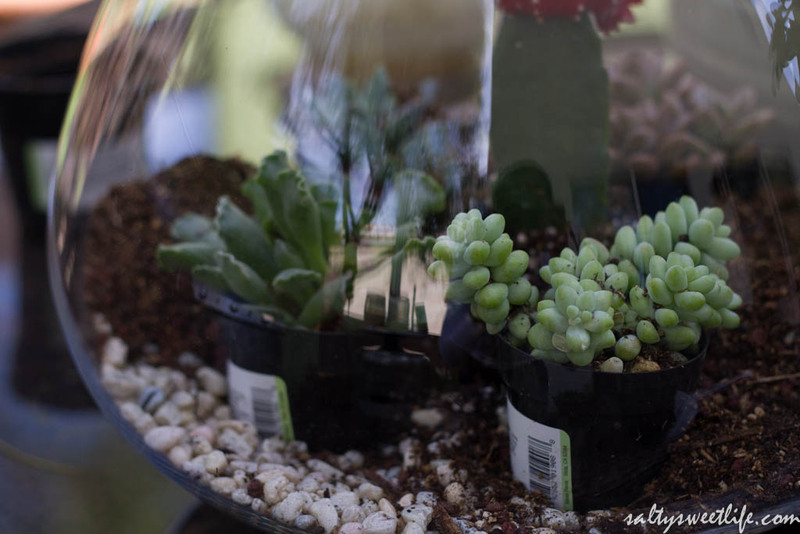 I saw this tutorial on West Elm’s website a while ago that showed how to make a succulent garden and suggested leaving the plants in their original pots–which seemed perfect for me! At least this way, when I kill them, they will be easy to replace! So, yesterday, needing to do something with my hands, I trundled over to the garden center for new succulents, some cactus planting mix and little white rocks. Since I was rehabbing an old terrarium and not starting from scratch, I had to do a little prep work. I discarded the old dirt and cleaned the rocks that had formed the bottom layer of the garden. I then washed the bowl with vinegar and water. After the bowl was completely dry, I poured a two inch layer of small rocks into the bottom of the bowl and then nestled the plants in their original pots into the rock layer. The moon cactus–that’s the one with the red top, had to be taken out of its pot because of its height, so I had to very carefully (wearing gardening gloves) set that one into place. 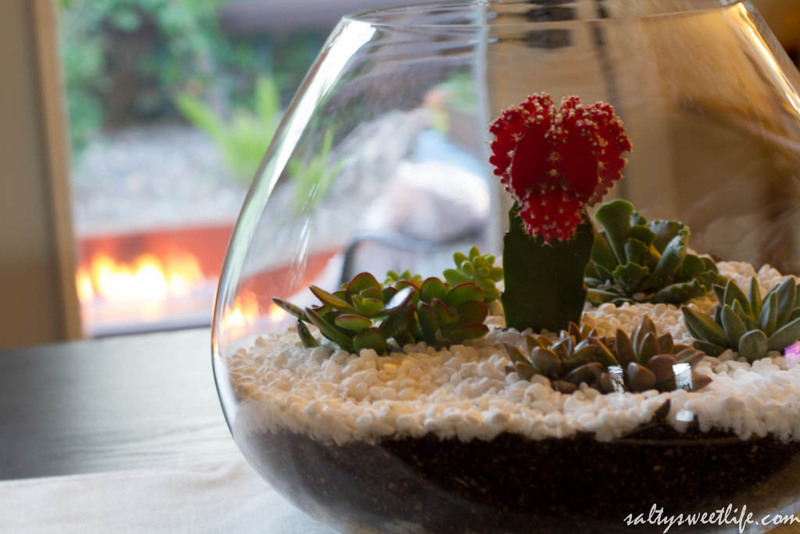 I took the cactus planting mix and carefully scooped it into the bowl high enough to cover the tops of the succulent pots. 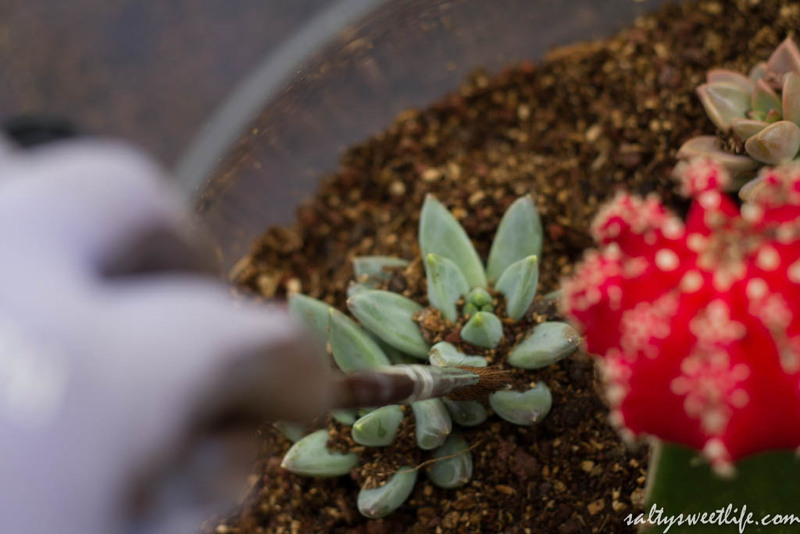 With a small, soft paintbrush I brushed off the soil that fell onto the plants. After that was done, I finished with a thin layer of small white pebbles, again using the paintbrush to dislodge the rocks from the plants as well. I’m pretty pleased with the outcome! It’s sitting on my dining room table, where it gets filtered sunlight from the backyard. I am going to try my best to keep these little guys alive! Knowing my tendency to over water, I’m going to set a reminder and only give them a small amount of water every 7 to 10 days. If anyone has some advice for me, please, feel free to write them in the comments section! 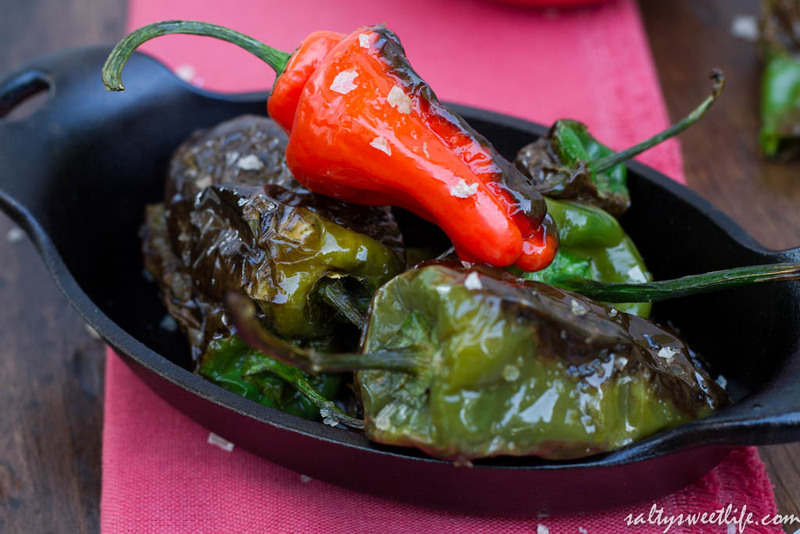 During the week, I was able to find these beautiful Padron peppers at Whole Foods Market. If you’ve ever been to a tapas bar or even a sushi bar, you will have encountered these as appetizers and they are amazing! 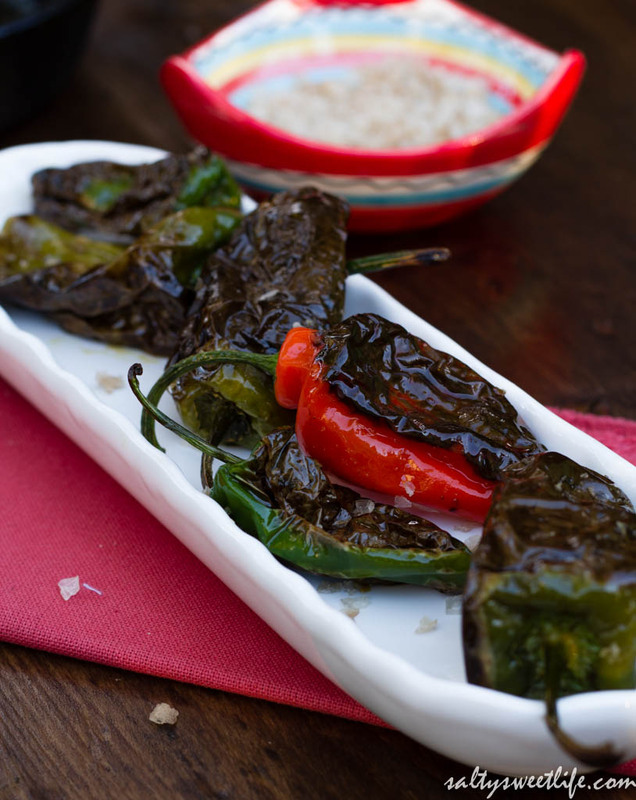 If you see them at a sushi bar or Japanese restaurant, they are typically called Shishito Peppers and at a tapas bar, Padron Peppers. The preparation is so simple that you don’t even need a recipe! 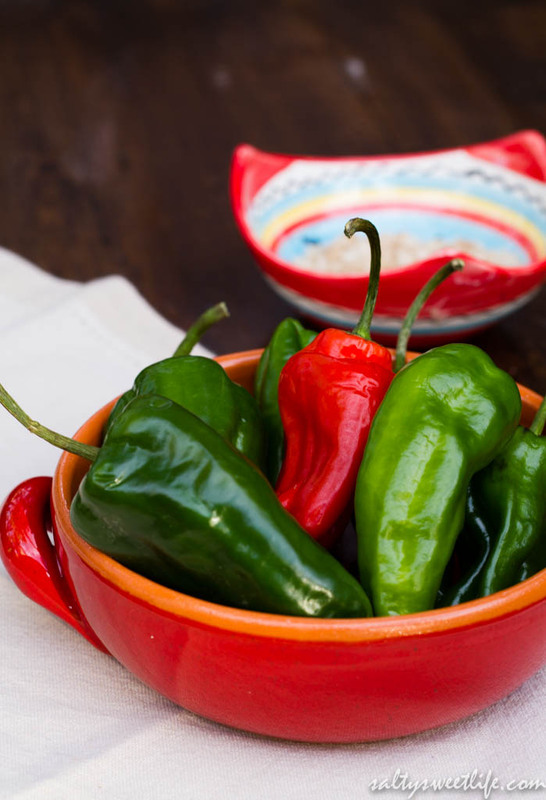 Three ingredients–olive oil, peppers, flake salt and you can make these at home for pennies! Adjust the amount of peppers as you require. Since I was on my own yesterday, I only made enough for me, but you can figure about 5 to 6 peppers for each person as an appetizer. 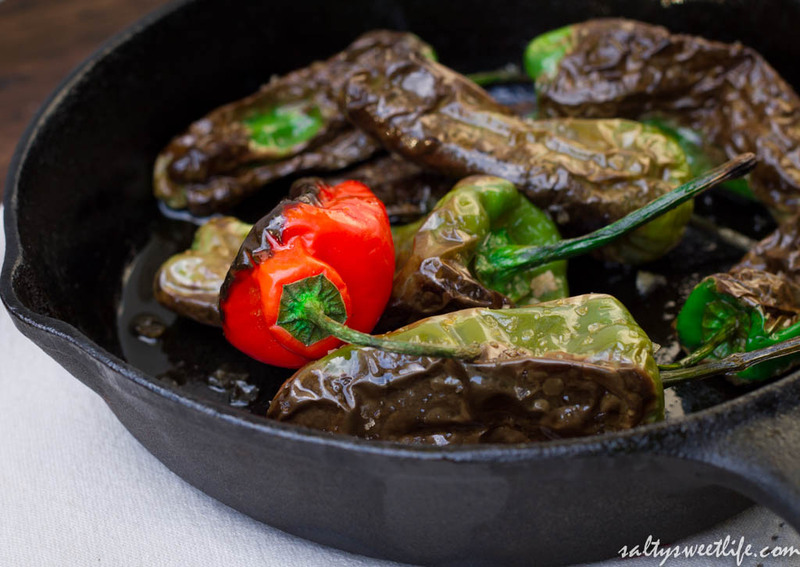 The fun thing about these peppers is that some of them are quite mild and others will blow your hair back, albeit not in a beads-of-sweat-on-your-forehead kind of way. A good amount of heat–just enough to keep life exciting! The red one was actually the mildest of the bunch and was very sweet. The charring of the skin gives them a wonderful, smoky flavor as well. Heat the olive oil in a frying pan over high heat until the pan is almost smoking. Add the peppers a few at a time to the frying pan, being careful not to crowd the pan. When the skin blisters use tongs to turn the peppers over and cook the other side until the peppers begin to shrivel, about 2-3 minutes. Remove each batch from the pan and place them on a serving dish and keep them in a warm oven (about 170 degrees). Repeat with the remaining peppers until they are all cooked. Sprinkle generously with the flake salt and serve piping hot as an appetizer! That is so sweet of you to say Erica! Thank you! Are you up and running yet with the new site? I’ve been looking for you! Alyssa I want to have a green thumb so badly! Do you know if they sell them on Amazon? I love these succulents, but at least this way, when I kill them, I can switch them out easy peasy! Thanks for the compliment!! Means so much! I’m sure I can handle the heat, those peppers look amazing! As for the terrarium, PPS (Plant protective services AKA my mama) has removed several plants from my home for mistreatment! Yours looks beautiful and it’s tempting me to give it a try. Ha Ha! 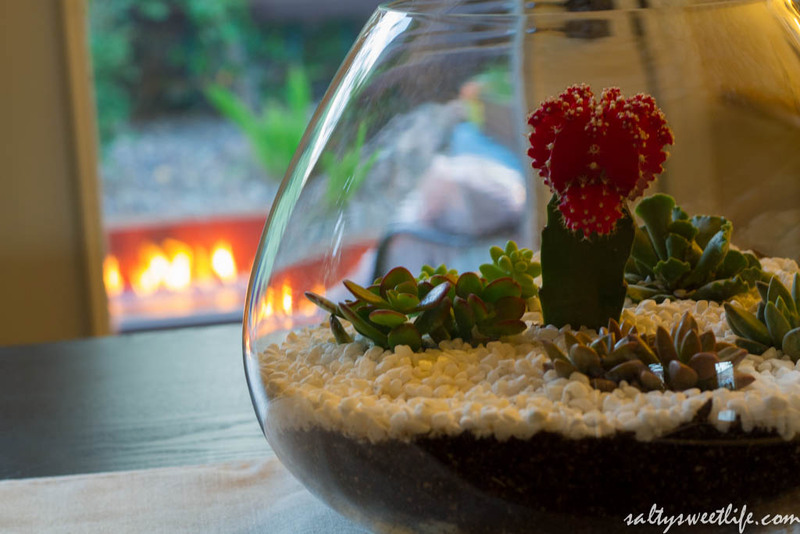 I can keep most of my houseplants alive for the most part, but succulents are another story! Too funny that PPS came and took yours away! I either water them too much, or forget to water them completely! Those peppers were very good and HOT! I’m so jealous that you found shishitos!! I LOVE them, and often pay exorbitant amounts for them at restaurants, but have never spotted them at =Whole Foods. My eyes are now going to be extra peeled. I love them too! So, the Husband returned yesterday from a long business trip (having missed the shishito peppers) so I went back to WF to get some and they were all gone! I’m going to keep looking!